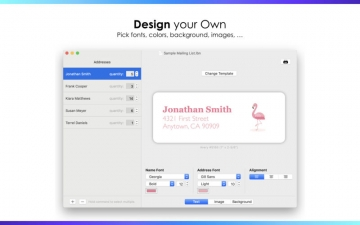 Address Labels by Nobody | Mac App Storeのアプリ検索・ランキング BuzzMac! ラベルは以下のサイズで提供されて: ⁃ ⁃ 1-1\/8\"x 3-12\"
Address Labels by Nobody allows you to design and print address labels with ease. 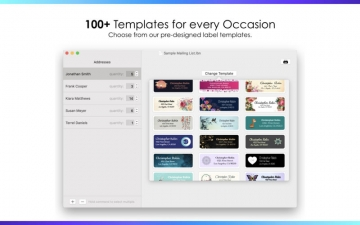 Choose from 130 pre-designed templates that offer different themes and patterns for every occasion. 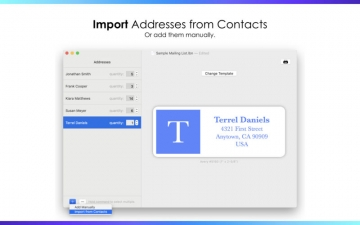 You can import addresses from Contacts, a CSV file or add them manually. 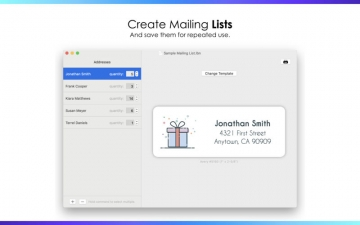 Create as many mailing lists as you want and save them for repeated use. 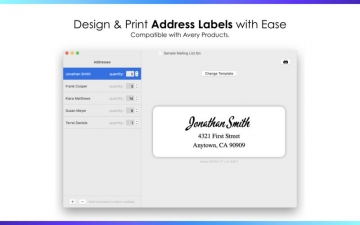 When using an Avery Product, Address Labels by Nobody allows you to choose where to start printing. You can use this feature to skip used slots on your label sheet. Address Labels by Nobody currently only supports US Letter sheets. We are working on adding A4 support in an update.